Credit: Courtesy: Drs. Miriam Stoeber and Damien Jullié. "This ground-breaking study has uncovered important distinctions between the opioids that our brain makes naturally and therapeutic opioids that can be misused," said NIDA Director Nora D. Volkow, M.D. "This information can be mined to better understand the potential adverse actions of medically prescribed opioids and how to manipulate the endogenous system to achieve optimal therapeutic results without the unhealthy side effects of tolerance, dependence, or addiction." Naturally occurring opioids and medically used opioids alike bind to the mu-opioid receptor, a member of a widespread family of proteins known as G protein-coupled receptors (GPCRs). Recent advances in understanding the three-dimensional structure of GPCRs have enabled researchers to create a new type of antibody biosensor, called a nanobody, that generates a fluorescent signal when a GPCR is activated. This enables scientists to track chemicals as they move through cells and respond to stimuli. Using this nanobody, the researchers first showed that when a naturally occurring opioid binds to and activates the mu-receptor on the surface of a neuron, receptor molecules enter the cell inside what is known as an endosome. There, the mu-receptor remains activated over a period of several minutes, which itself was a new discovery, since it was believed that the opioid receptor is only activated on the surface of nerve cells. Proteins that interact with receptors on the cell surface control all sorts of biological processes and provide targets for therapeutic intervention. With opioid medications, however, the researchers made two additional discoveries. First, there are large differences across a range of clinically relevant opioid drugs in how strongly they induce receptor activation in endosomes. 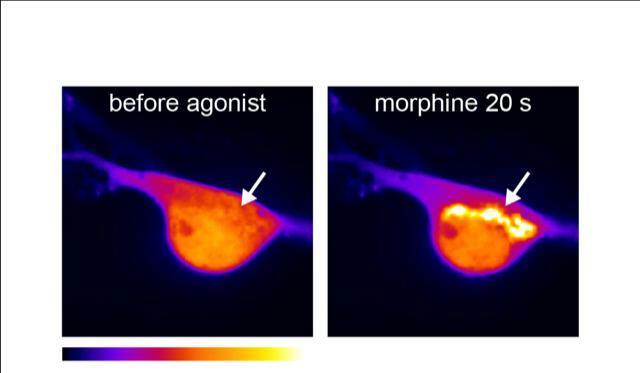 Second, the opioid drugs uniquely induce rapid nanobody signaling, within tens of seconds, in an internal cellular structure known as the Golgi apparatus in the main body of the neuron. Further investigation showed that therapeutic opioids also uniquely activate mu-opioid receptors in related structures, known as Golgi outposts, in the long, branched structures of neurons. Based on these findings, the researchers hypothesize that current medically used opioids distort the normal time and spatial sequence of mu-opioid receptor activation and signaling. This distortion may provide the mechanistic link that explains the undesired side effects of opioid medicines suggests new avenues for designing agents that do not produce addiction or other adverse effects associated with these drugs. "This new biosensor opens our eyes to a previously unknown level of diversity and specificity in the cellular actions of opioids," said Dr. Miriam Stoeber, the study's first author. Dr. Mark von Zastrow, senior author of the study, added, "We were surprised to see that drugs such as morphine activate opioid receptors in a location at which naturally occurring opioids do not." About the National Institute on Drug Abuse (NIDA): The National Institute on Drug Abuse (NIDA) is a component of the National Institutes of Health, U.S. Department of Health and Human Services. NIDA supports most of the world's research on the health aspects of drug use and addiction. The Institute carries out a large variety of programs to inform policy, improve practice, and advance addiction science. Fact sheets on the health effects of drugs and information on NIDA research and other activities can be found at http://www.drugabuse.gov, which is now compatible with your smartphone, iPad or tablet. To order publications in English or Spanish, call NIDA's DrugPubs research dissemination center at 1-877-NIDA-NIH or 240-645-0228 (TDD) or email requests to [email protected] Online ordering is available at drugpubs.drugabuse.gov. NIDA's media guide can be found at http://www.drugabuse.gov/publications/media-guide/dear-journalist, and its easy-to-read website can be found at http://www.easyread.drugabuse.gov. You can follow NIDA on Twitter and Facebook. Should patients in remission stop taking expensive Rheumatoid Arthritis drugs?